Acute low back pain (low back pain that starts suddenly) is very common. Many things can cause it. Most people's back pain gets better within three months and doesn't need further treatment. However, it's always best to see a health professional (GP, chiropractor, osteopath, or physiotherapist) early to get personal advice, exercises, and any other treatment you might need. Following the steps below will generally improve your back pain. Keep doing your normal activity as much as possible. Walking, cycling and swimming can help. You may have some discomfort as you try to keep active, but do what you can without causing any significant pain or discomfort. Decreasing the amount of bending forward you do, and instead doing backwards-bending exercises, can help a lot. While lying on your front do 10 back bends every one to two hours. You may be able to do this exercise while standing, but ask your health professional first. Good sitting posture is important. Put a rolled-up towel (or lumbar roll) in the small of your back when you're sitting. 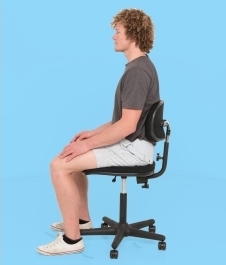 If you sit at work, make sure your chair is adjusted properly to support the small of your back. Make sure your feet are flat on the floor or a footstool, and your chair points straight at your desk or screen. Try to avoid any bending or lifting. 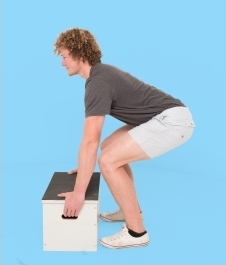 If you do have to lift something, point your feet towards the thing you are lifting, bend at your knees and hips. Keep items close to you while you are lifting and carrying. Sleep in any way that's comfortable on the most comfortable surface, as long as it is flat and not sagging. We used to advise people to sleep on a firm mattress, but there is no evidence that this is better than any other type of mattress. Some people find that a small, firm pillow between their knees, or a folded towel under the small of their back makes them more comfortable when sleeping. Get back to work as soon as possible – you don't need to wait for the pain to go away. Returning to work (or staying at work if you can) generally helps to heal your back. If you are worried about your work, talk to your employer and treatment provider about what you can and can't do. Some people need to gradually ease back into their usual work tasks, perhaps doing fewer hours and not doing physical tasks like heavy lifting or twisting. ACC can also help you get back to work if you are having problems returning to your normal duties. If you do all the things mentioned above, your back pain should start getting better within a week, even if it doesn't go away completely. If it has not started getting better, or if your pain is getting worse you should see a doctor, chiropractor, osteopath or physiotherapist. Written by HealthInfo clinical advisers. Endorsed by Canterbury Initiative low back pain workgroup. Page created March 2017.